Log-in to the subscribers’ area to view digital editions of S&C Magazine, analyze our optimized indicators, and download or copy spreadsheets and programming code that has been featured in past isssues. If you have questions about your magazine subscription (change of address, expiration date inquiry, etc. ), please visit our Circulation page. The above information can be obtained from your magazine label. For help locating your Subscriber ID number, click here to look it up via your email address, call us at 1-800-832-4642 or send an e-mail to Survey@Traders.com. If sending an e-mail, please include your name and mailing address. 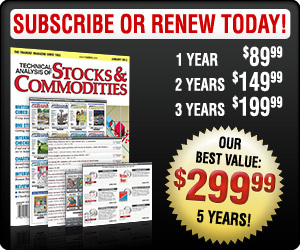 Not a subscriber to Technical Analysis of STOCKS & COMMODITIES magazine? Click here to subscribe, or request a trial subscription.